« Had a blast at CAST! This time I’m telling about my workshop experiences, including a session of Avalon gameplay with testers at CAST. I really enjoyed the workshop. Though the most interesting part for me was not about TDD. Self-organizing team. Maybe not by intent the workshop has perfectly demonstrated this challenge of Agile. The first group I started with (people I was sitting next to) already had folks with programming skills and domain knowledge so I wasn’t needed and was asked to help another team. The second group had all programmers within but no domain knowledge (Canadian postal codes) but didn’t seem to be concerned with that and was actively discussing their interpretation of the requirements. I was initially accepted but my careful attempts to contribute as a tester were ignored. They had a lively discussion going on and weren’t inclined to listen to any ideas or concerns. When I quietly departed they didn’t even notice. The third group I approached had all testers but no programmers. I received a warm welcome and was included into discussion. Even though my idea of the approach (to slice vertically) was different from they had in mind they gave me time to explain it. The group decided to implement in modular approach: code everything phase by phase. I went with the flow. I decided that the “mob programming” exercise itself was more important than arguing over the approach while the clock is ticking. Here’s the thing about Agile and so called “the whole team approach”. If the whole team – and it’s mostly programmers – finds your ideas not fitting with them they will either ignore you or push you out. Well, testers often say something that may upset programmers, how are they supposed to fit? The game pits Arthurian Knights against the evil Mordred and his minions. Merlin is a good player who is told at the beginning of the game who the evil players are. If the evil players lose the game, however, they have one last chance of redeeming themselves by correctly guessing Merlin’s identity. If they can do this, the evil players win. 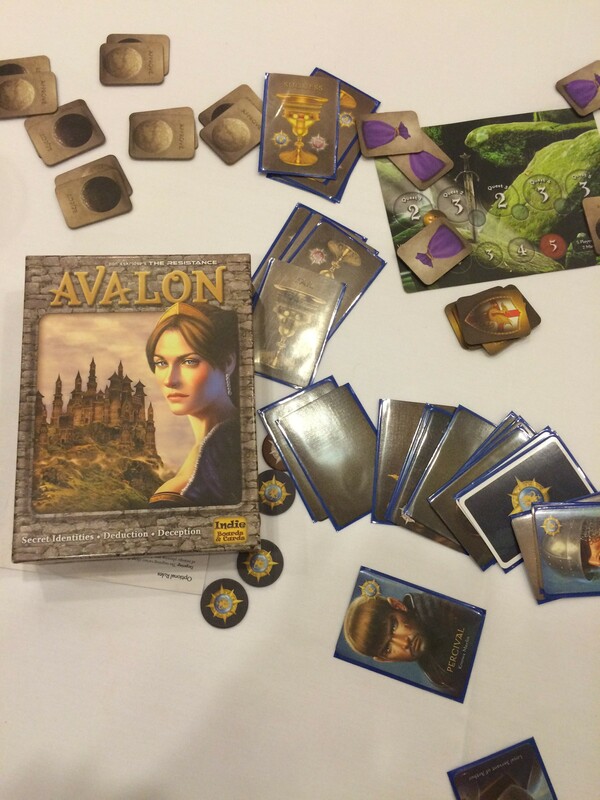 Avalon works best when played with 7 or 8 people, as more specialty cards are added to the game based on how many people are playing. As well as the Loyal Servants of Arthur and the Minions of Mordred, there are character cards with special powers. Percival, on the side of Good, knows who Merlin is at the start of the game and is in a position to help protect Merlin’s identity. Mordred, on the side of Evil, does not reveal his identity to Merlin at the start of the game, leaving Merlin in the dark. Oberon (Evil), does not reveal himself to the other Evil players at the start of the game, nor does he gain knowledge of the other Evil players. Morgana, on the side of Evil, appears to be Merlin—revealing herself to Percival as Merlin. Learning. There are strategies and tactical moves. It is fast-paced. And also scaleable in the sense of numbers of games and numbers of players. Rules also scale. Human interactions and psychology matter. There are no single right or wrong moves but there are heuristics that players need to adapt to the context of a particular party. And it’s also fun! It’s very friendly, very engaging, fun to win and fun to lose. Main takeaways: need to learn quickly and adapt quickly, use my observation skills, experiment, and learn from the situational feedback. A perfect game for team building. This was my workshop, my game. I have quite a few learning takeaways, too. How I presented my material. Publication accompanying the workshop is available at CAST 2015 Proceedings page.